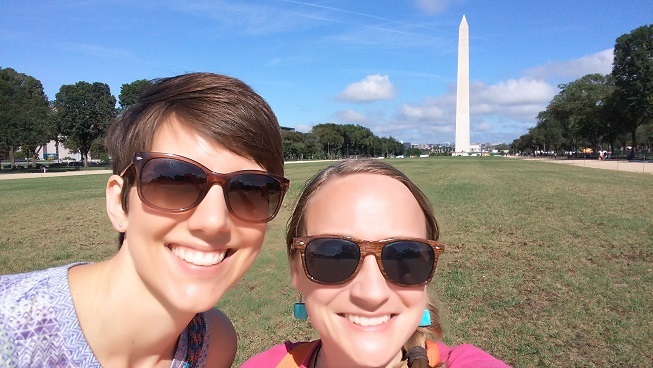 Suzanne Walker and Caitlyn Stypa, staff of the Indiana Young Readers Center located in the Indiana State Library, attended the National Book Festival in Washington, D. C. on Sept. 1, 2018. This diary describes their time at the festival. Caitlyn and I had a very early start the day before the festival. I am not kidding when I say that I woke up at 4 a.m. Our flight was at 6:50 a.m. Yikes. I headed to Caitlyn’s house and woke up the neighborhood when her dog decided to wish me a very good morning repeatedly. We finally got on the road. I did miss my turn to go to the airport, which I’ve never done before. I blame the fact that Caitlyn and I were chatting. We chat a lot. All that being said, we arrived at the Indy airport and were on our way with no problem. Our flight was great. 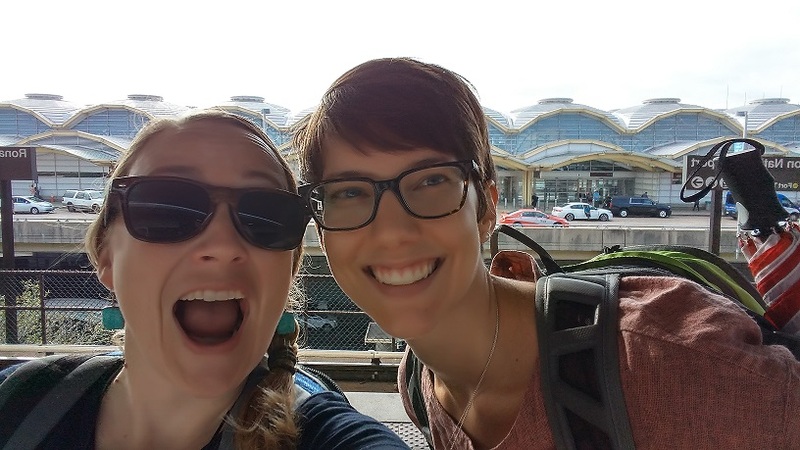 Here we are at the D.C. airport getting ready to jump on the metro. Our first stop is the convention center to set up our booth! Here is our booth for the National Book Festival. Indiana always tries to make a good showing at the festival. 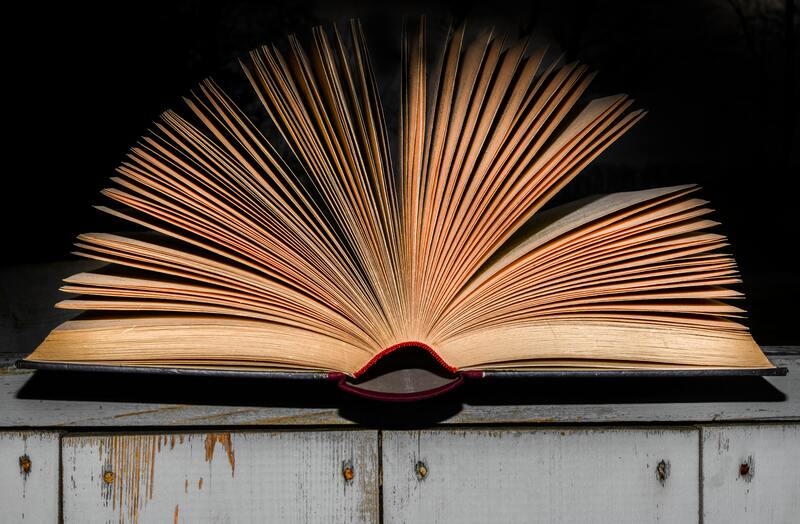 The festival is a free event with book sales, author talks and signings, multiple stages and lots of activities for visitors, including the Parade of the States. Each state shows up with their signature stamp and a book that they are highlighting. Visitors get a map of the USA and collect stamps from each state. The day is usually a blur of children pushing maps in our faces for us to stamp. This is both good and bad. The good part is that we can see a lot of people, but the bad part is it can become a bit repetitive. 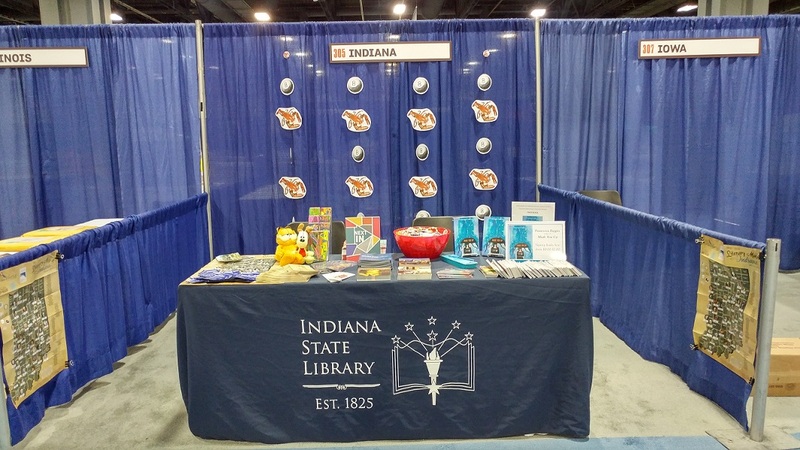 We are hoping that our unique decorations will make people ask us about our highlighted book, because what do lobsters have to do with Indiana? I’ll answer that later! 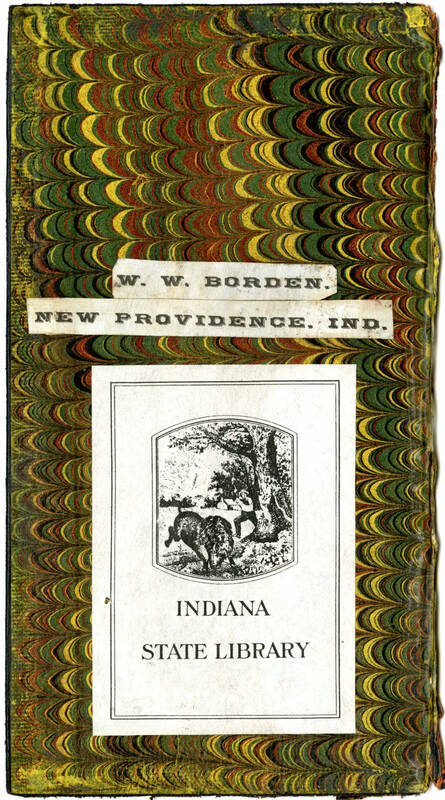 Indiana always has great bookmarks to give away that are donated to us by Ball State University. This year was no different. We have thousands of bookmarks to give away. 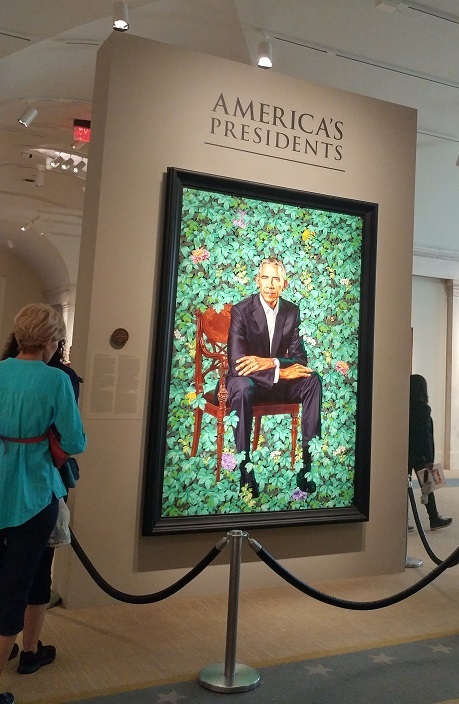 Once our booth was ready, we had enough time to take in a museum before my evening meeting at the Library of Congress. 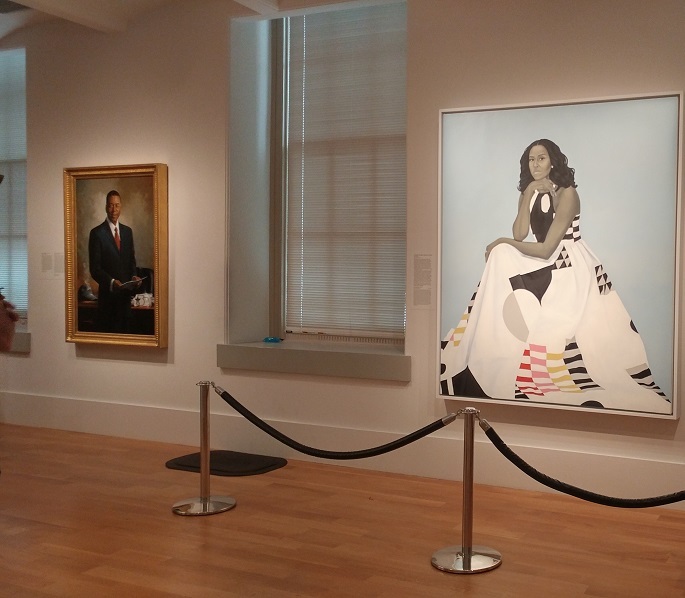 We headed to the National Portrait Gallery and got to see the newest presidential portraits, a gallery of Native American portraits done by George Catlin and some more modern pieces including a map of the U.S. done in neon lights and television screens. 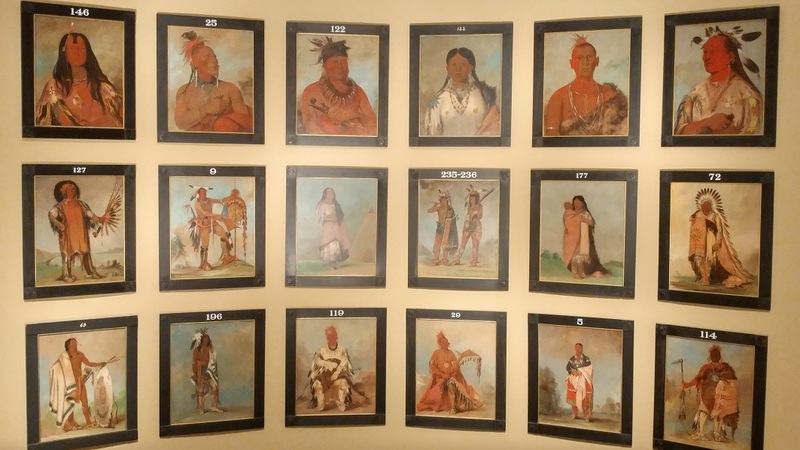 I was really interested in the Catlin portraits because of the work we recently did on a new video describing the murals at the ISL. 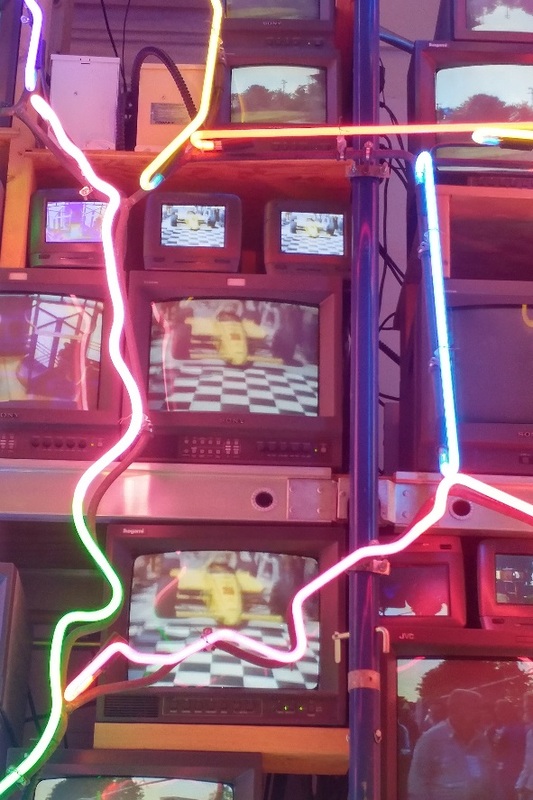 I was glad to see the Indy 500 represented in the modern neon map. Caitlyn stayed at the National Portrait Gallery while I headed off to the Library of Congress for my meeting, which was primarily about Letters About Literature. It was all good stuff. 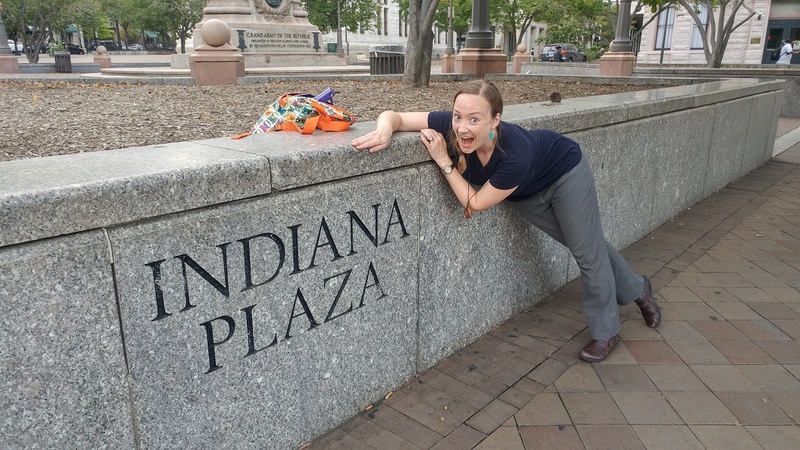 Caitlyn and I met up after the meeting in an amazing location for two ISL employees to meet in D.C.
Clearly I was excited to find the Indiana Plaza. 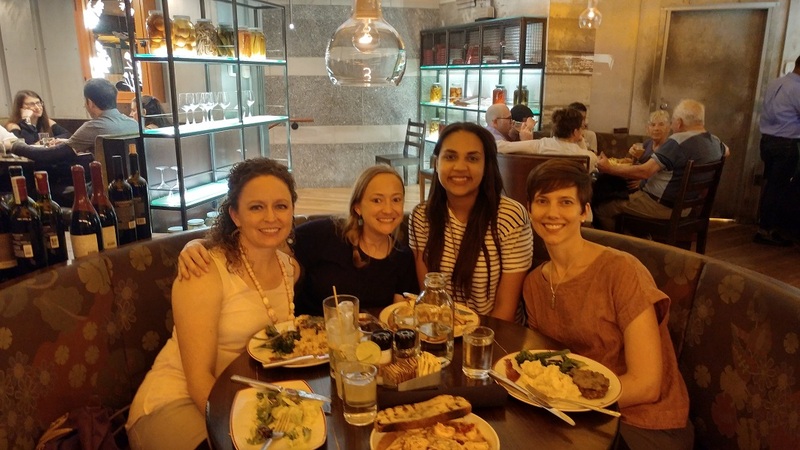 You can’t tell too much from this picture but it was HOT in D.C.
Our long day was topped off by dinner at Founding Farmers. We had a great time meeting up with old and new friends before we hit the hay to rest up before the National Book Festival tomorrow. Yawn. More tomorrow. Wow! What a great day we had at the National Book Festival! We started out with breakfast at the hotel and then did the quick walk over to the convention center. We were there by 8:30 a.m., with doors opening at 9 a.m. We said hello to lots of other states and had to run over to the Maine table to explain about the lobsters. Didn’t want any drama with a fellow state! 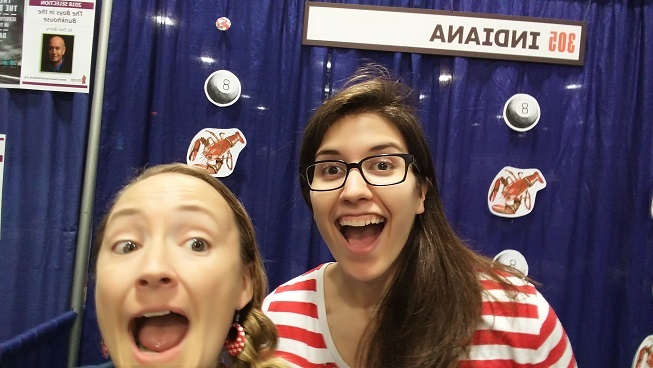 So here’s the story of why the Indiana booth was covered with Magic 8-Balls and lobsters: The book we chose to highlight in our booth this year was “Made You Up” by Francesca Zappia. 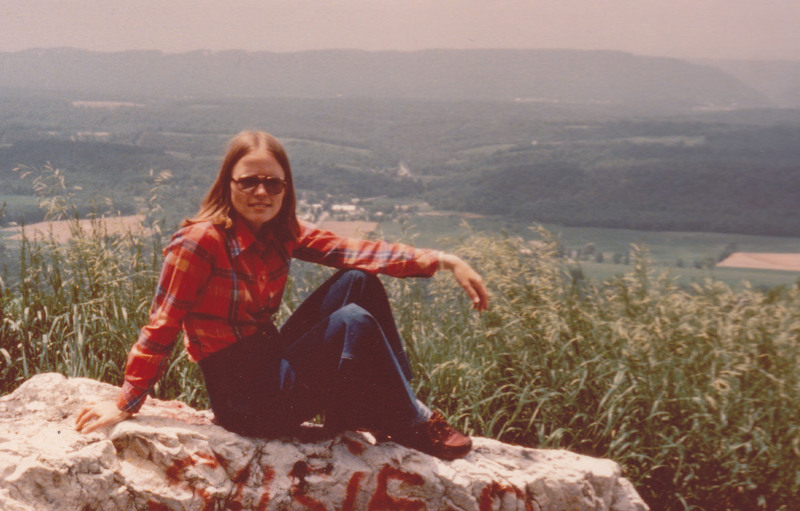 Chessie, as we call her because we are now best friends, was only 19 when she wrote the book. She grew up in Indianapolis and is a dream to work with. The book is about a girl who has schizophrenia. She uses a Magic 8-Ball to help her decide what’s real and what’s not and lobsters also have a big role in the book. And guess who showed up at our booth!? Chessie herself! 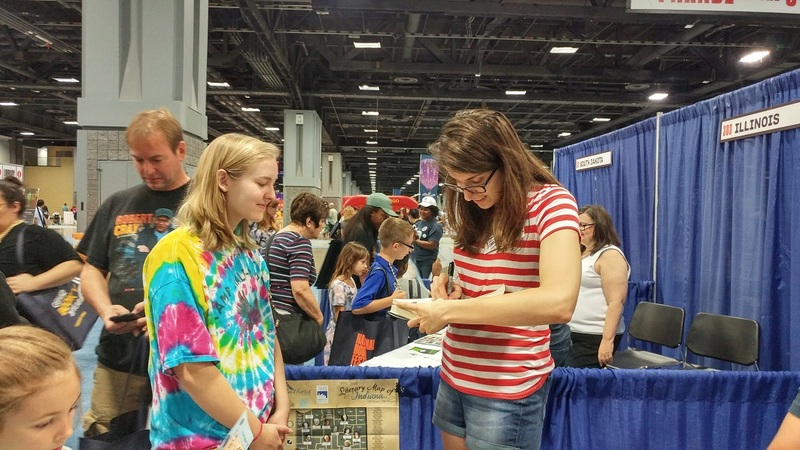 Francesca was at our booth from 10 a.m to 12 p.m. signing books, bookmarks and helping us stamp maps. It was great to hang out with her and she loved the lobsters and Magic 8-Balls that decorated our booth. Did I mention that our decorations were drawn by an ISL staff member? True story! And they turned out great. Here’s me and my good friend, Francesca Zappia. Here’s Caitlyn, stamping yet another map. By 3 p.m. I was searching for an aspirin to help with the headache that was doomed to appear. Minnesota helped me out. 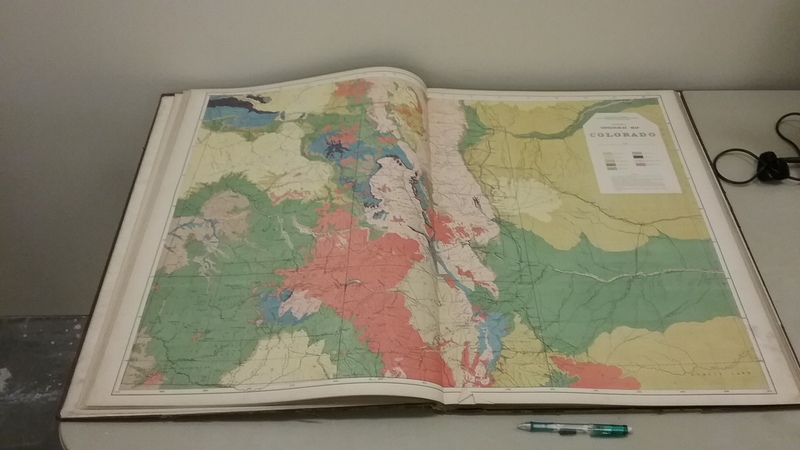 We stamped more maps and at 5 p.m. we packed up our booth and heaved a sigh of relief. 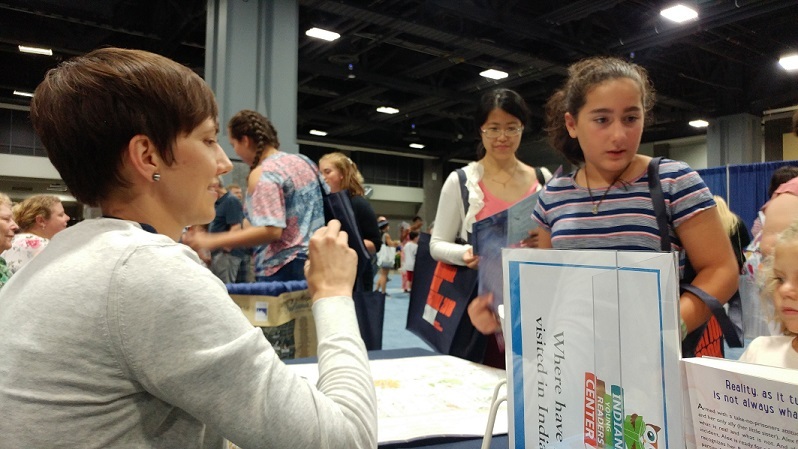 Another successful National Book Festival in the books (excuse the pun)! After the festival we had dinner with representatives from Alaska, Wisconsin and Michigan. 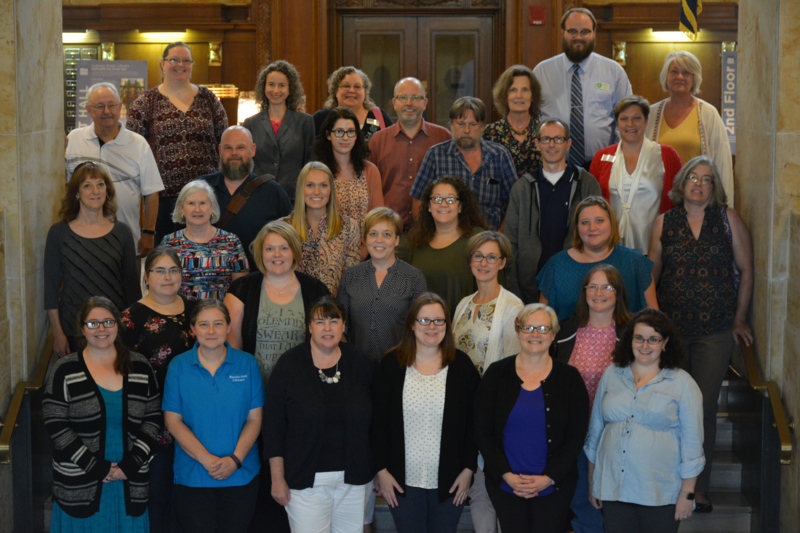 We swapped NBF stories and invited each other to see our representative state libraries. After dinner, Caitlyn and I might have gotten some gelato and then we definitely crashed. Good night! Caitlyn and I head back to Indy at 5 p.m. today. We have just enough time to see the National Mall and one museum before we head to the airport to get checked in for our flight. We had a great time representing Indiana at the National Book Festival! This infamous quote was given by Indiana Rep. Earl F. Landgrebe the day before President Richard Nixon formally resigned. Prior to being elected as representative for Indiana’s 2nd District, Landgrebe had served in the Indiana State Senate from 1959 to 1968. In 1968, he succeeded Charles A. Halleck as a member of the U.S. House of Representatives in the same election that also put Nixon in the White House. 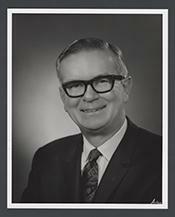 After Landgrebe was defeated in the 2nd District by Floyd Fithian, the Indiana State Library acquired his political papers from his period at the U.S. House of Representatives from 1968 to 1974. 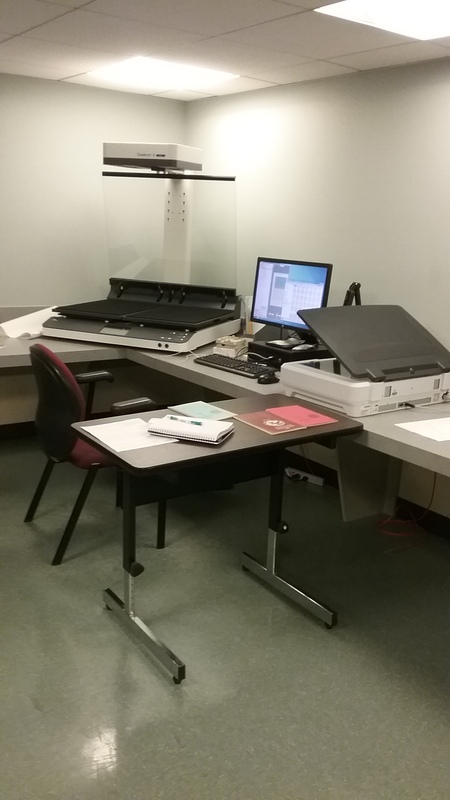 Previously sealed, the papers were recently processed – a project of about 18 months – and are now open for research under the identifier L625. 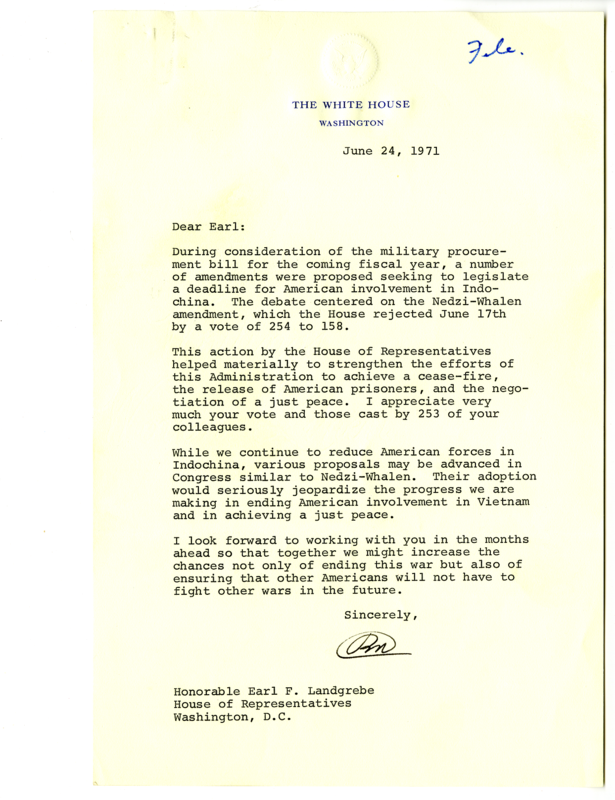 A piece of correspondence from Nixon to Landgrebe. Typical hallmarks of 20th century political papers include correspondence with other politicians and notable contemporary figures, correspondence from constituents regarding issues of the day and in-depth discussion and research into issues that were important to the politician and the population they were serving. 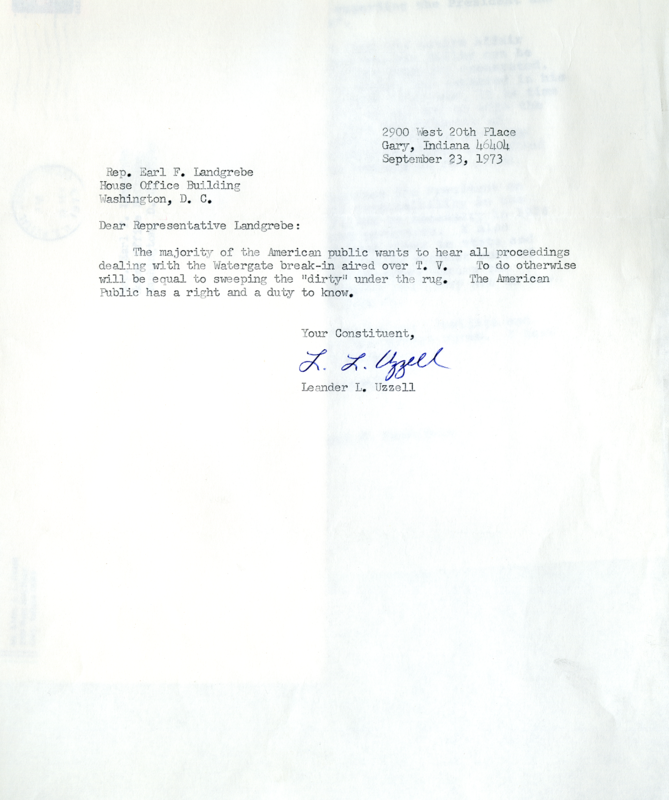 Besides standard correspondence between Landgrebe, his constituents and other notable Hoosiers and the day-to-day functions of a U.S. representative, the collection includes material on several other notable topics. 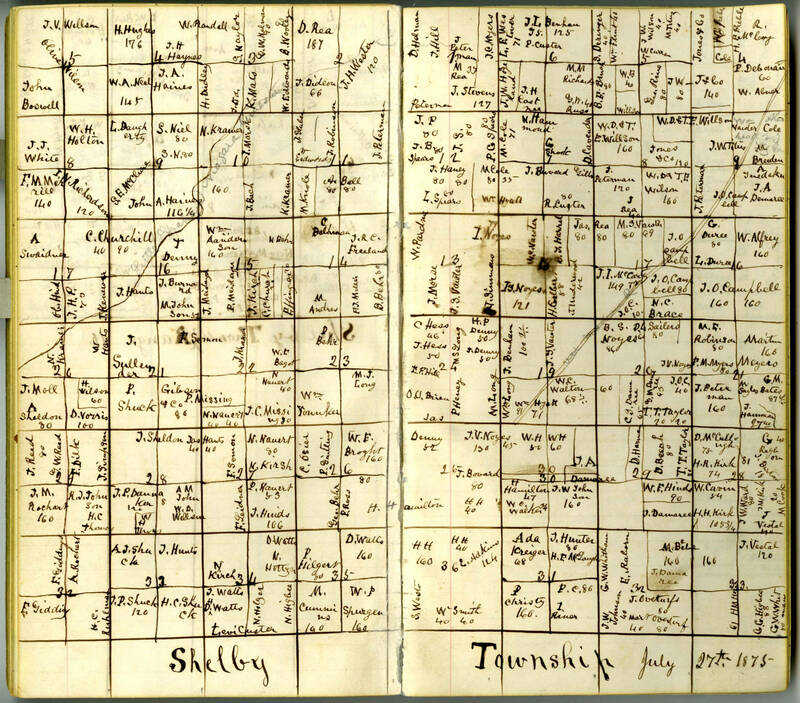 For example, the Indiana subject files give a snapshot of the strengths and needs of the Hoosier state during the early 1970s. 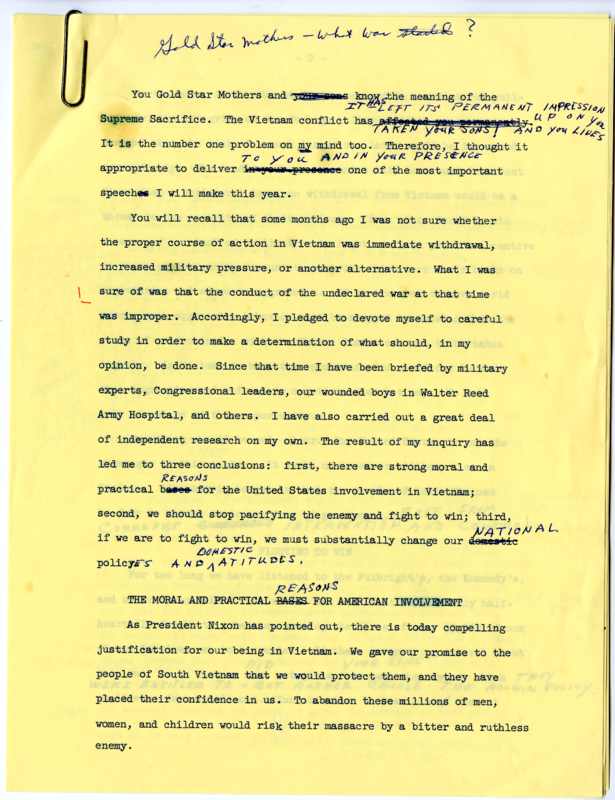 Organized alphabetically by topic or state agency, these papers show how the state was handling anything from education to veterans’ affairs at the time and to what extent Landgrebe was involved. A draft of a speech on Gold Star Mothers. Series 2, pertaining to legislative affairs, is the deepest area of the collection. There is extensive coverage on notable issues from Nixon’s administration, including Vietnam, the draft, Watergate, abortion and OSHA. Another area of interest, particularly to Indiana researchers, is the material on the Indiana Dunes National Lakeshore. After 1966, when the National Lakeshore was established, there were efforts to expand the boundaries of the park, which Landgrebe opposed, as he opposed most things! The first expansion bill wasn’t completed until 1976, but there is a great deal of information on the Indiana Dunes National Lakeshore in the collection from the years 1969 to 1974 when Landgrebe was in Congress. A piece of constituent correspondence on Watergate. In 1974, Landgrebe returned home to Valparaiso and resumed presiding over his family trucking business. He died on July 1, 1986. Despite being a contentious presence in the U.S. House as well as in his district, Landgrebe leaves behind a wealth of information about the legislation and social debates of 1970s America. 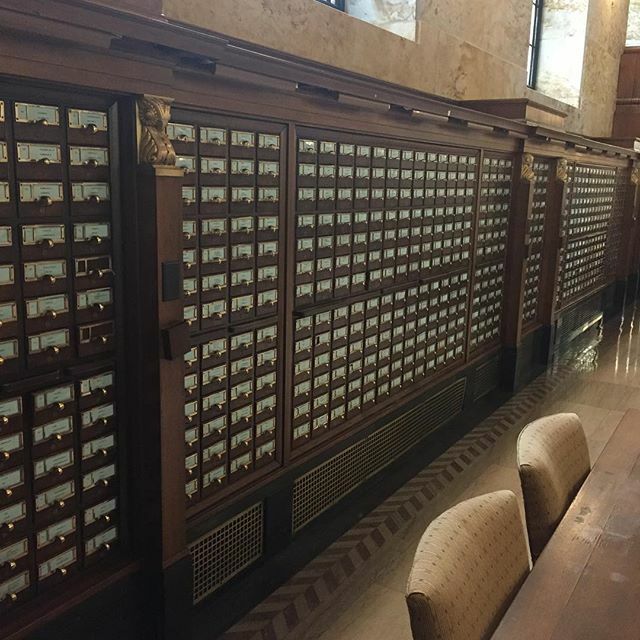 This collection serves as a fruitful resources for researchers of Indiana politicians, 1970s politics, the Vietnam War, the history of Northwest Indiana and more. Pearson, Richard, “Obituaries: Earl F. Landgrebe,” Washington Post, July 1, 1986, Accessed September 6, 2018. 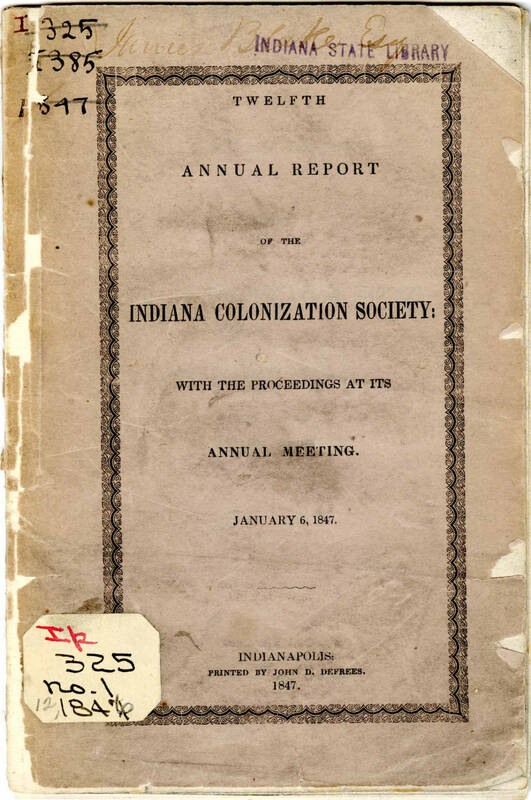 The Indiana Colonization Society, formed 1829 and based in Indianapolis, advocated for the relocation of free people of color and emancipated slaves in Indiana to settlements in Liberia, Africa. The ICS was an auxiliary of the American Colonization Society, located in Washington, D.C., which formed in 1817. Premised on the idea that an integrated society was impractical and impossible, “colonizationists,” who were overwhelmingly white, argued that black people could find liberty only in Africa. A small portion of free people of color who agreed that justice, liberty and prosperity could not be achieved in America emigrated. Critics, such as free black people and abolitionists, voiced strong opposition to this movement. They asserted that the agenda of the society was counterproductive for racial reconciliation and integration, that it was overall an ineffective scheme to combat slavery and finally that it undermined anti-slavery efforts. Free people of color who wished to “fight against slavery and for equal rights as American citizens” viewed this plan as effectively abandoning those still enslaved.1 “Abolitionists saw the colonization movement as a slaveholders’ plot to safeguard the institution of slavery by ridding the country of free blacks.”1 Colonizationists maintained that their motives were benevolent and philanthropic, but even supporters questioned whether the idea of relocation was even practically feasible or financially realistic. 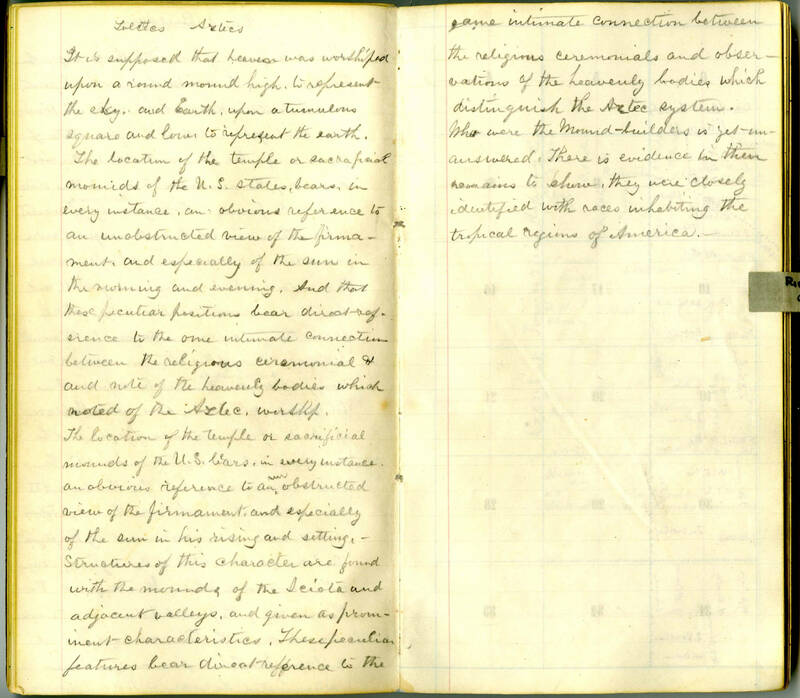 In 1852, ICS advocacy led to a state initiative when the Indiana General Assembly formed the Indiana Colonization Board and began providing funds to help, “Indiana free blacks emigrate to Liberia on the western coast of Africa.”1 The state government appropriated funds to finance the purchase of land in Liberia and for the transport and support of immigrants. According to Anthrop, “eighty-three” free people of color emigrated from Indiana to Liberia, but the state board facilitated the departure of “only forty- seven” of those emigrants. During the 1840’s, 1850’s and 1860’s advocates and critics within the movement and the government squabbled over complaints about financial arrangements, funding cuts, fundraising methods, settlement location and administration and over negotiations with the government of Liberia. James Mitchell, in an 1855 “Circular to the Friends of African Colonization” apprising society members of the progress and obstacles faced by the movement, admitted the paltry sum of $65 per person for emigration was insufficient to provide for transportation, and offered nothing for support or protection of immigrants. In the final report in 1863 to the State Board by its secretary, the author William Wick, concluded that the movement had been a “total failure.” Wick attributed this failure to the ambition of formerly enslaved people to be equal in social status to white Americans. 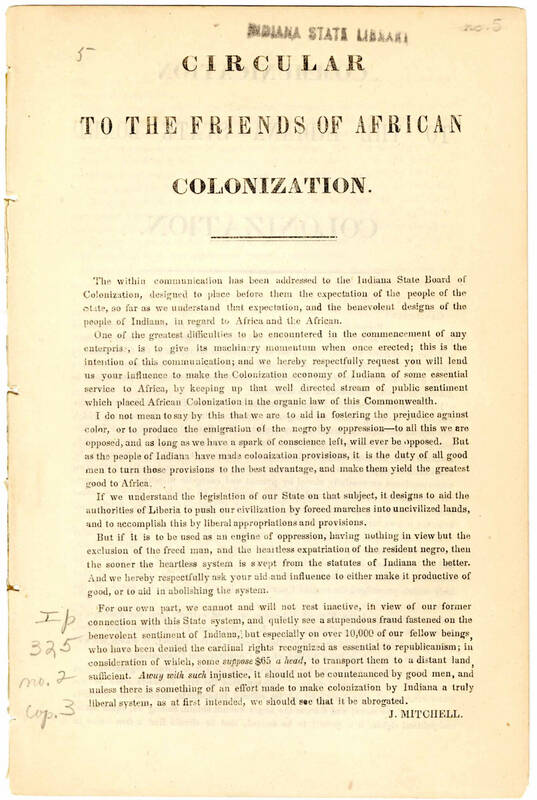 The types of records in the sub collection of the Colonization movement include government documents, such as the report to the State Board of Colonization, organization records, such as Indiana Colonization Society reports, circulars that act as newsletters to supporters, private society correspondence disseminated to influential political operatives and the society’s monthly publication The Colonizationist, as well as a campaign literature from the 1860 race for the governorship of Indiana in a the form of speech by Oliver P. Morton. These materials offer insight into the theoretical and philosophical tenets of the Colonization movement, document its efforts, successes and obstacles, provide historical context and can be used to map out its historical trajectory from a burgeoning movement to abject failure. Scholars and students will find these items to be a rich resource for exploring the history of the Back-to-Africa movement. 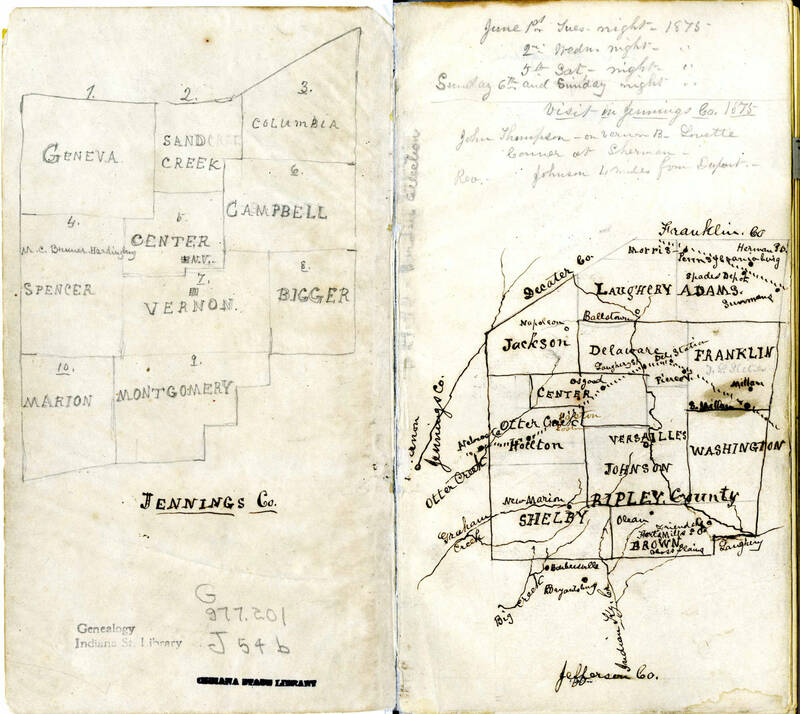 Genealogists and historians will find in these primary sources a wealth of information on the individuals active in this movement, and on those who ultimately emigrated to Liberia. 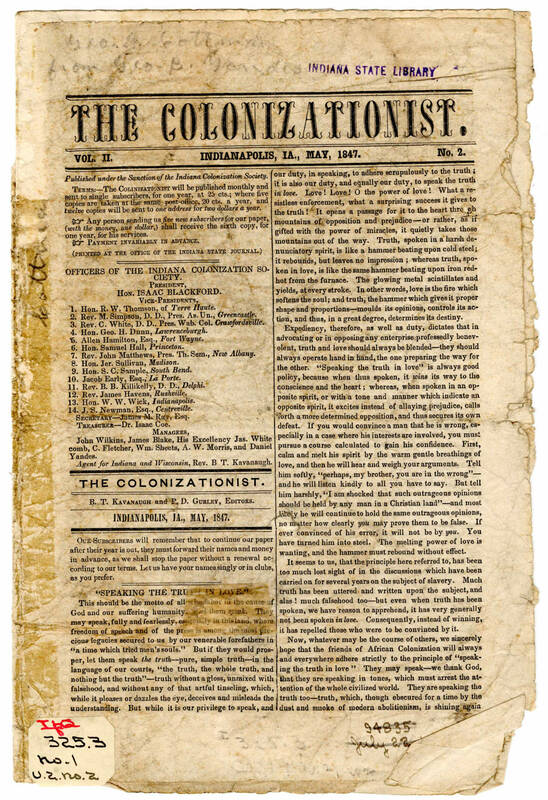 The Colonizationist, owned by John D. Defrees, was the monthly publication of the Indiana Colonization Society and was printed by the Indiana State Journal in Indianapolis. The ICS, formed in 1829 and based in Indianapolis, advocated for the relocation of free people of color and emancipated slaves to settlements in Liberia, Africa. The publication was edited by B.T. Kavanaugh and P.D. Gurley. Kavanaugh was a Methodist minister and the agent of the ICS. Gurley, who was the minster of the First Presbyterian Church of Indianapolis from 1840-49, and again in 1859, was appointed the Chaplain of the United States. This 1855 circular is addressed to the Friends of African Colonization. 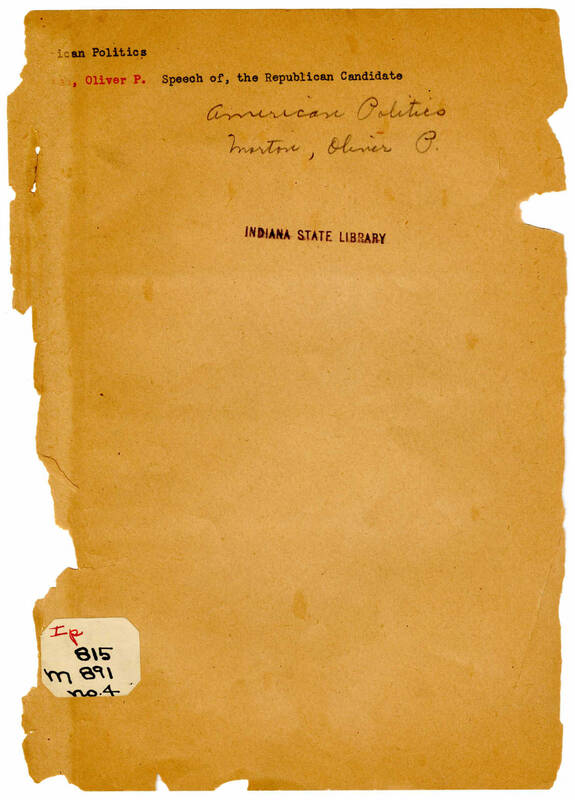 It is comprised of a one page introduction and a long letter addressed to the Indiana State Board of Colonization. The author, the Rev. 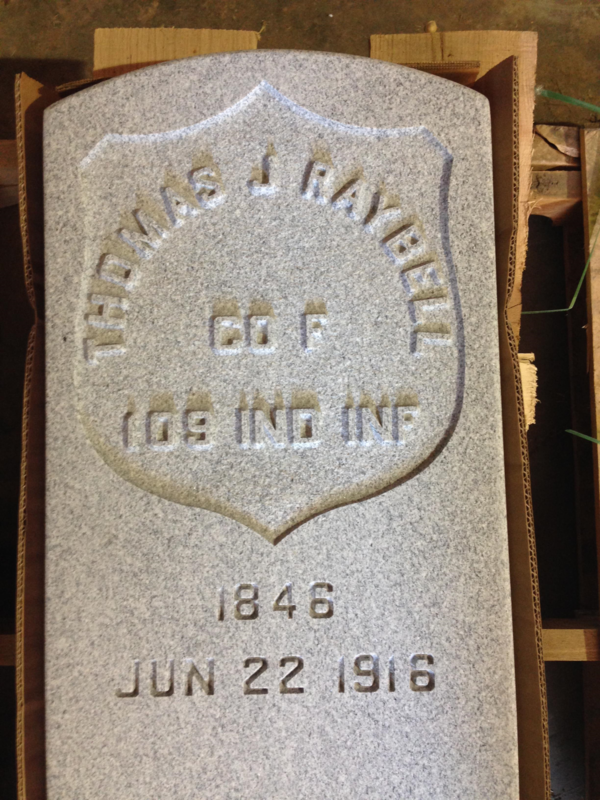 James Mitchell was the Secretary of the American Colonization Society of Indiana. In the circular, he lists reasons for inaction of the board in the past, legislative, financial and administrative obstacles faced, and lays out a detailed plan for action. 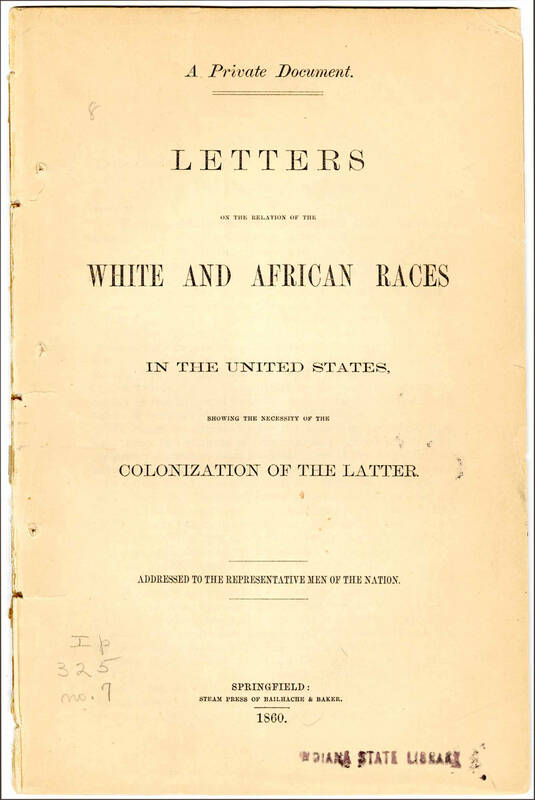 This pamphlet is a collection of private letters written by James Mitchell as agent of the Indiana Colonization Society, on the subject of the African Colonization movement, detailing the actions, policies and theoretical foundation of the organization. It is addressed to the candidates for the 1860 U.S. presidential election. 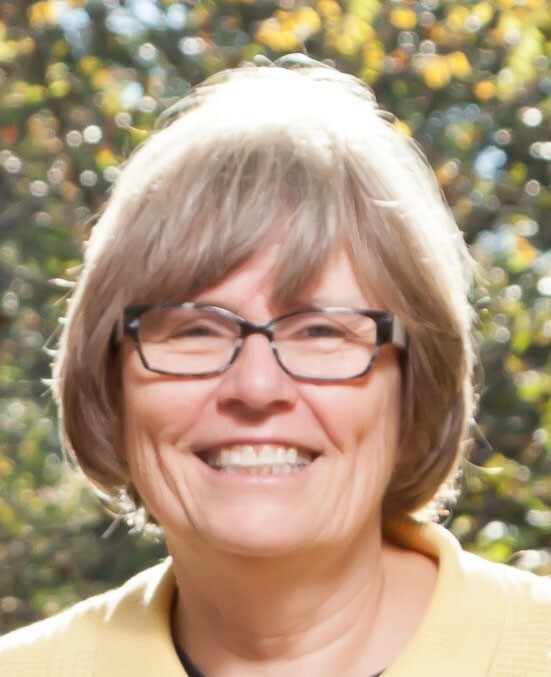 Mitchell seeks to privately communicate the aims of the movement to popular leaders and the future president. The correspondence includes an extract from the 1852 report to the legislature of the state of Indiana titled, “The Separation of the Races Just and Politic,” an 1857 letter from Mitchell to President James Buchanan and an 1849 letter to President Zachary Taylor. This is a speech by Republican candidate for Lieutenant Governor of Indiana, Oliver P. Morton, delivered in Terre Haute on March 10, 1860. 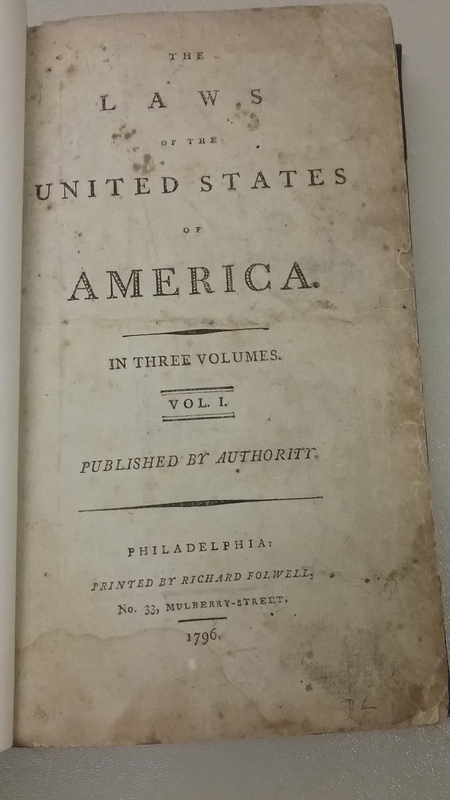 The speech discusses campaign issues, such as popular sovereignty, the expansion of slavery into new territories, “sectional parties,” John Brown, the fugitive slave law, hostility between north and south, abolition, tariffs and homesteading legislation. Morton and his running mate won the election of 1860, with Lane opting to take a seat in the Senate, Morton became the 14th Governor of the state of Indiana. 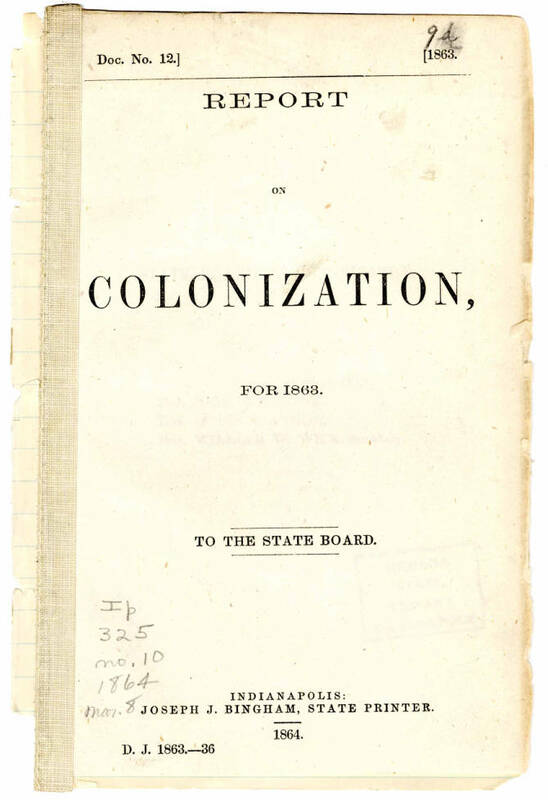 This 1863 report on the Colonization movement is authored by the Secretary of the State Board of Colonization William W. Wick. It is addressed to the Colonization Board, but is intended for all members of the legislature and the public. Wick writes to report the “total failure” of the Colonization movement. 1. Anthrop, M. (March 2000). 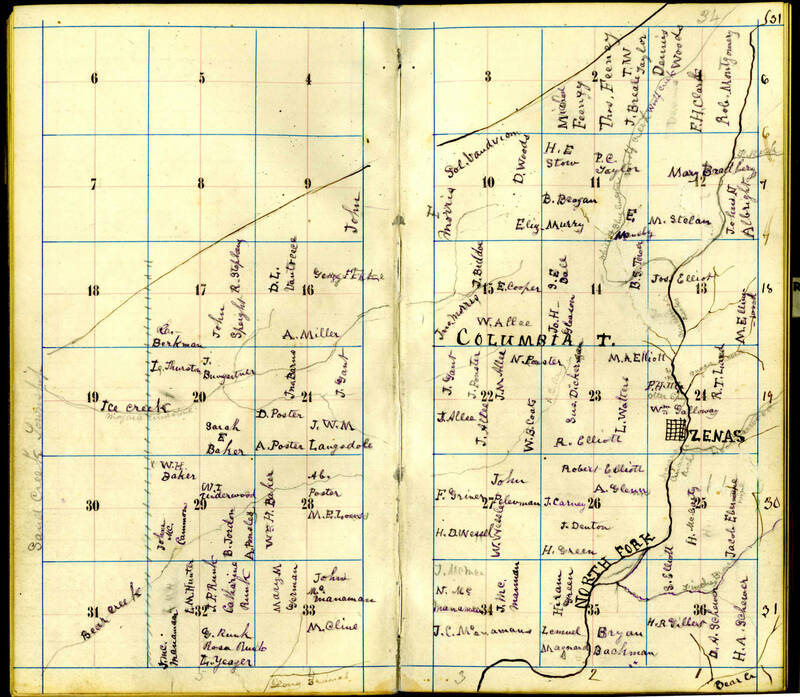 Indiana emigrants to Liberia. 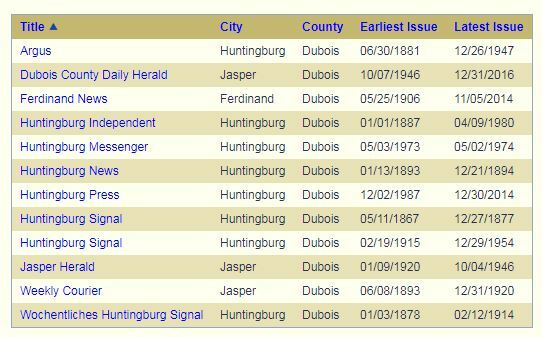 The Indiana Historian, March 2000. Indiana Historical Bureau. 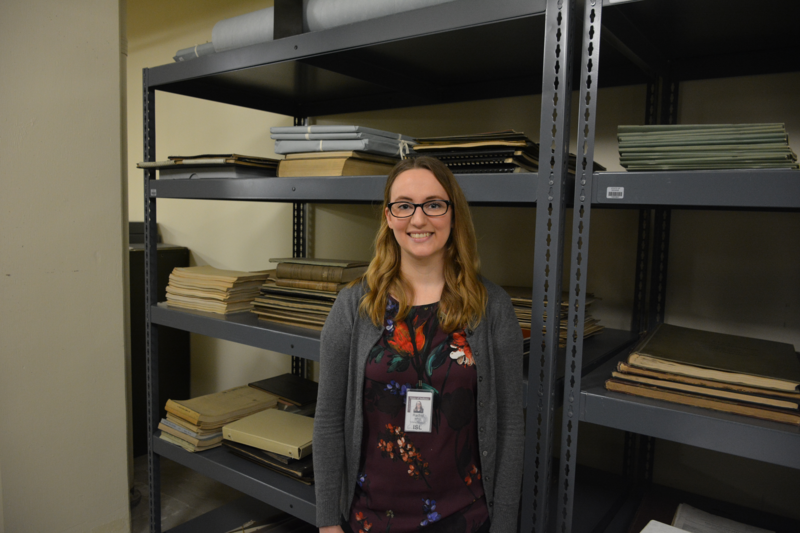 This blog post was written by Ricke Gritten, Indiana Division intern at the Indiana State Library.